What is curd? Sweet curd is made with 4 main ingredients. 3 of which are always butter, sugar, and eggs. The 4th ingredient is normally a tart or citrus flavour. Once made properly it sets to a dropping consistency. This is because both the butter and the egg yolks play a part in the setting process. You’ve probably heard of lemon curd. It is extremely easy to make – in fact, if you want to see me make it, plus get the recipe you can head on over to my lemon curd recipe by clicking the image below. 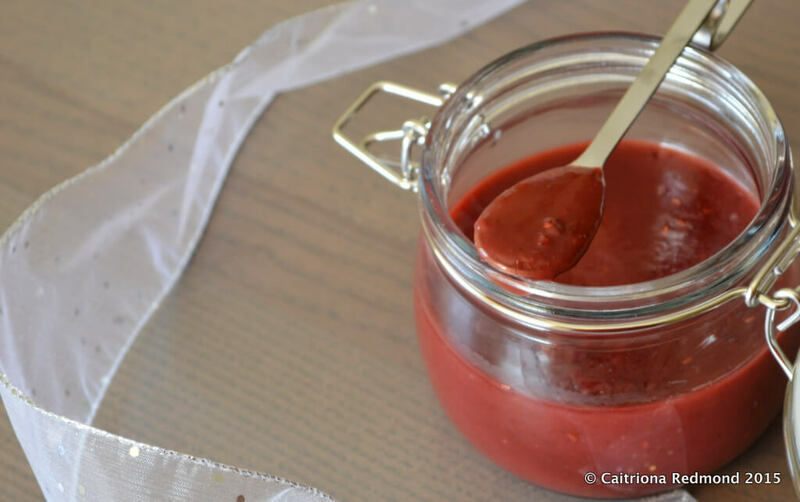 Raspberry curd is not a complicated recipe, the hardest part of making curd is allowing for the time it takes to stir the mixture until the eggs are cooked. Why raspberry curd? Well as I mentioned above, curd works best with tart or citrus ingredients. I had raspberries and a Mother’s Day dessert to make for the family. For those who follow me on social media, you probably already know that I spent Mother’s Day shovelling manure, then cooking part of a Mother’s Day feast for the extended family (giant ham and dessert). Himself got away with making just 1 cup of tea for me! It’s not exactly most people’s idea of an ideal Mother’s Day but I was happy enough, despite the lack of tea. This recipe makes approximately 350ml of curd. You could fit it all into a large kilner jar (I get mine in Ikea), or use it straight away. I’m told it keeps for 3 days in the fridge, not that I’d know as it has never lasted more than 1 day in this house. I suggest you use this as a spread for your bread (instead of both jam and butter), stirred into natural yoghurt, as a dip for some plain biscuits, eat it with a spoon, poured warm over vanilla ice cream, stirred into Eton mess, and it’s best enjoyed when you don’t have to share the flipping stuff. Take a large saucepan and fill it 2 inches high with hot water. Place it on a medium-low heat. Fit a large glass bowl on top, making sure that the bottom doesn’t touch the water – this is called a “bain marie”. Put the butter into the bowl, along with the sugar and raspberry mash. Stir until the sugar and butter dissolve. This takes some time so have a cup of tea to one side while you do it. Once dissolved, take a large whisk, and whisk in the 2 egg yolks. Whisk lightly until the egg is cooked. You will know it’s cooked because (a) the mixture will be too hot to touch, and (b) the mixture will coat the back of a spoon – when you draw your finger through the mixture you’ll get a clean patch, like a river. You can see this in the video for lemon curd if you’re curious. Pour the cooked curd into a sterilised glass jar, allow to cool completely before sealing a kilner – as otherwise you’ll get condensation and sweaty bits on top of the curd. Note, I prefer my curd a little on the tart side. If you feel this is too tart for you, add some more sugar at the start of the cooking process, likewise if it’s too sweet, use less! 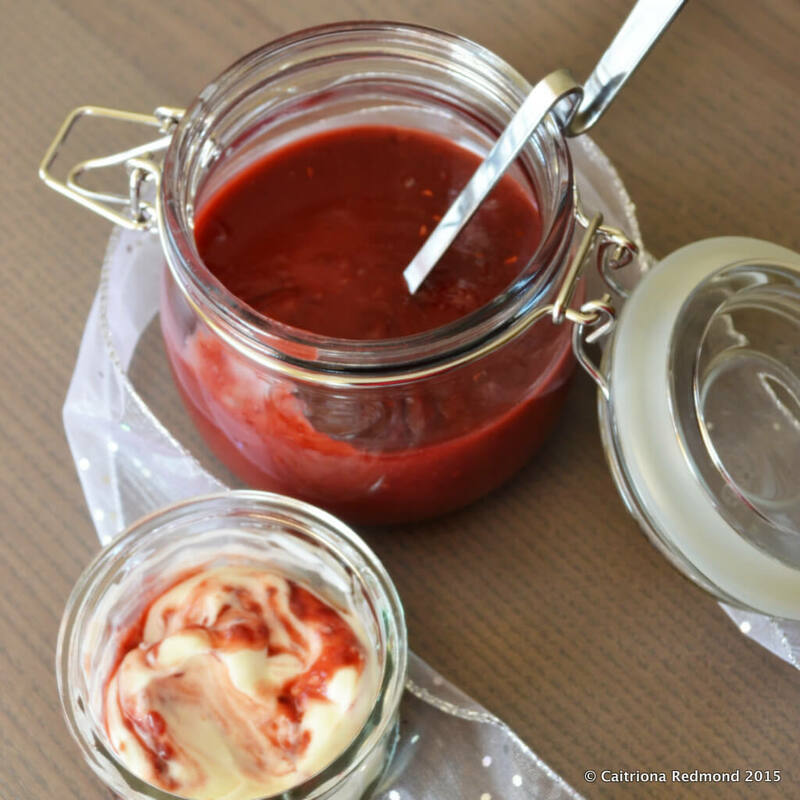 You may like to try making some gooseberry curd once the berries come into season. I have a recipe for that too! Click the image below to visit it. Looks so good! I can’t wait to make this. Thanks I hope you like it! Yum. This recipe might come in handy when our raspberries are ripe . Can you make Raspberry Meringue (as opposed to lemon!) pie with this ?! Absolutely you could. That would be delicious! Do you use thickener in curds? Whenever I make lemon curd for meringue I use cornflour but I guess that’s cos it’s not intended for spreading? Hi Deborah, no I don’t use thickener at all. The combination of the egg yolks & butter will make it set on its own. If it’s a firm set you’re looking for – then maybe use an extra egg yolk instead? This looks lovely, never occured to me that I could use raspberries! Must give this a try. Do give it a go Tracey. It’s fab!